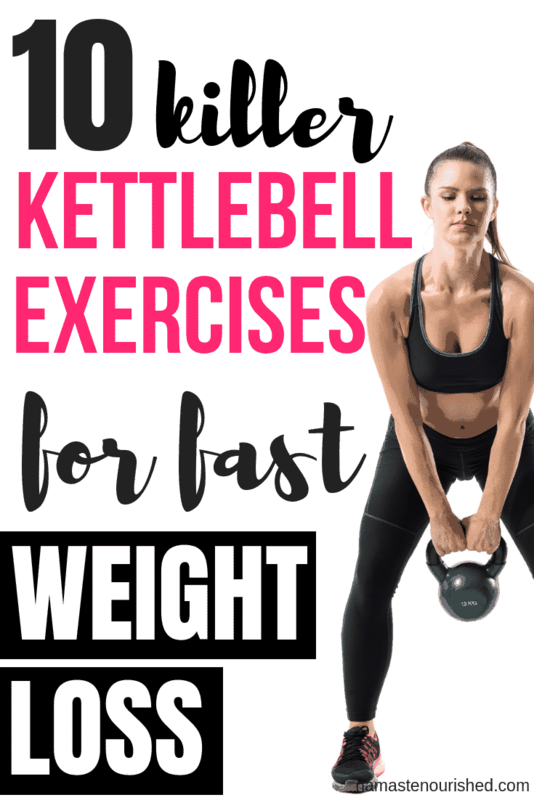 If you’re after a high-intensity exercises that torches fat, can be completed in 20 minutes, works your entire body and can be done by beginners to advanced athletes, then kettlebells are the equipment you’re looking for. Recently, I was diagnosed with Morton’s neuroma, a painful, non-cancerous growth that surrounds the digital nerve of the second and third toes. This painful condition means that I’m no longer able to do the high intensity interval training that I’ve always loved. Of course, I wasn’t willing to just give up exercise completely, so I set out to find an alternative to HIIT that torched calories and was just as fun. They say that every cloud has a silver lining, right? Well for me, the cloud of my morton’s neuroma allowed me to discover the awesomeness of kettlebells. Since then, kettlebell workouts have completely replaced my HIIT, and I now workout with kettlebells 3-4 times a week on average. Kettlebell workouts are fast, fun and extremely effective at torching calories and burning fat! The American Academy of Exercise found that the average person can torch 400 calories in just 20 minutes with kettlebells. That is INSANE. When I first learned that, my mind was blown. I don’t even know how long it takes on the treadmill to burn that many calories, but it’s sure as heck more than 20 minutes. Here’s the only downside about kettlebells – basically everyone uses them incorrectly when they first get started. And this means that not only is your workout not as effective, you can actually risk injury. If you have a spare $9 (yep, just 9 bucks) and you want a complete kettlebell workout guide, done-for-you coaching guide and exercise library then I recommend you check out Lean Bells. Fun fact – kettlebells originate in Russia way back in the 18th century. Called “girya” in Russian, a kettlebell was actually a metal weight used to measure crops. Eventually, kettlebells began to be used by farmers in strength competitions. Kettlebell sport (known as girevoy sport) is incredibly popular in Russia. While girevoy sport hasn’t really gained mainstream popularity outside of Russia, the use of kettlebells as part of an exercise regime is rapidly gaining popularity in the United States. It’s a valid question, but in reality, kettlebells and dumbbells are two entirely different pieces of equipment. While there are some movements that can be done with either a kettlebell or a dumbbell, a kettlebell allows a ballistic or explosive style of movement as opposed to a dumbbell which is most commonly used for slow, measured movements like dumbbell curls. In addition, the uneven center of gravity of a kettlebell works your core muscles, which helps to tone and flatten your tummy. What Kettlebell Weight Should I Choose? Kettlebells vary in weight from 9lbs all the way up to over 200lbs. When you’re first getting started, it’s important that you choose the right kettlebell weight. There is no “one-size-fits-all” weight when it comes to kettlebells. Just like any other piece of gym equipment, there are a variety of factors that go in to choosing the right kettlebell weight for you. However, here’s something to keep in mind with kettlebells – choosing a weight that is too light can actually cause injury due to incorrect form. You might be tempted to “start small” and choose a very light weight. I’d recommend that you do not do that, otherwise you will increase your injury risk. As a ballpark figure, most kettlebell experts recommend that women start with an 18lb kettlebell, and men start with a 35lb kettlebell. However, you know your body the best, so I’d encourage you to go to your local sports store and get a feel for the different weights, listen to your own body, and make an informed decision from there. 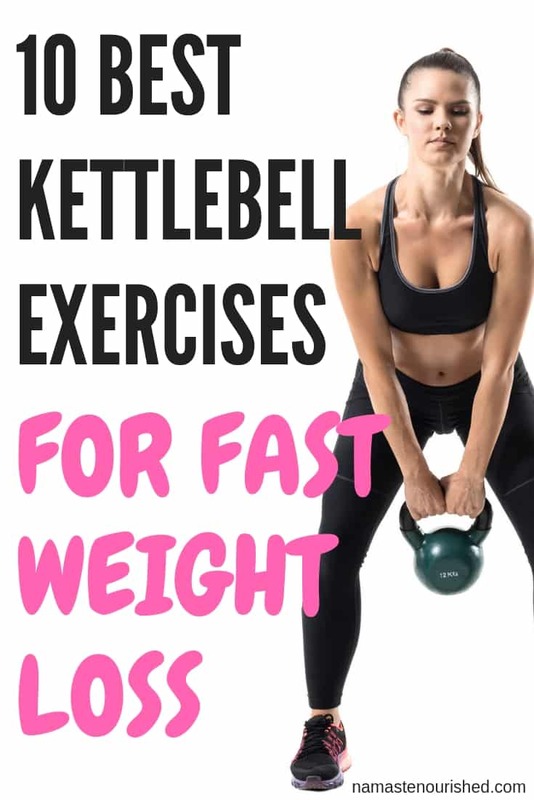 Ok, now onto the kettlebell exercises for weight loss! Before you attempt any of these exercises, I highly recommend you watch the video entirely through. Once you’ve gotten a good grasp of how the movement is performed, then go ahead and give it a go! Thanks, some great exercises here showing just how much you can do with a humble kettlebell. They’re pretty awesome – one of my favorite things to use! I now know what a kettlebell windmill should look like. Thank you for the video!